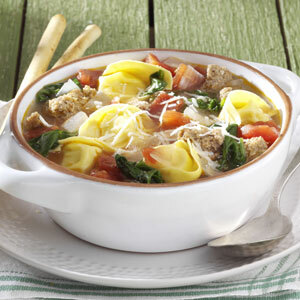 This tortellini soup recipe is quick to prepare and rich in healthy and tasty ingredients. Crumble sausage into a Dutch oven then add the onion. Cook over medium heat until meat is no longer pink. Add broth, water and tomatoes and bring to a boil. Add tortellini and bring to a boil. Cook for 7-9 minutes, stirring occasionally. Lower the heat, add the spinach, basil, pepper and pepper flakes. Cook for 2-3 minutes or until spinach is wilted. Serve with cheese if desired.